Today is the last day of the Christmas in July blog hop. I do hope you've enjoyed all of the fabulous tutorials that have been shared over these weeks, I know I feel energized to get some holiday sewing done! 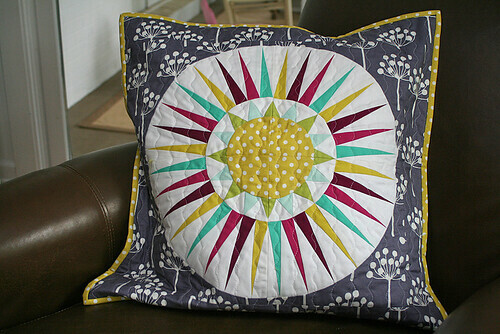 Our blogger today is the fabulous Felicity of Felicity Quilts. Felicity is a Canadian quilter, who just recently taught her first workshop with the Vancouver Modern Quilt Guild, and I absolutely love the stacked strips quilt she's had in the works for a while. Felicity is sharing with us a lovely Holly Berries pillow cover, complete with a zipper closure! 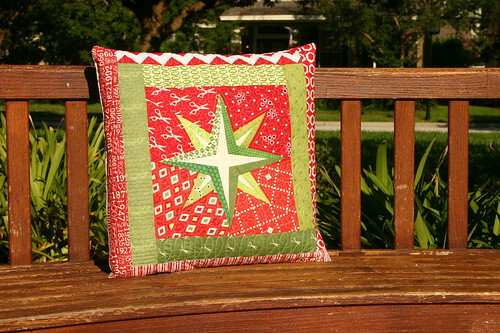 Such a sweet holiday pillow, and Felicity's tutorial makes it quite easy to make as well. 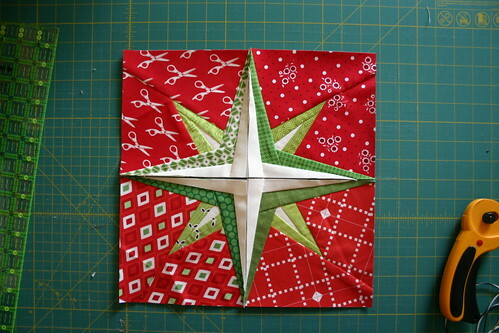 Be sure to stop by Felicity's blog to check out her tutorial and to enter to win a gift certificate to Fat Quarter Shop! Thanks again to everyone for following along with the Christmas in July festivities. I sure hope these tutorials will give you a head start on your holiday sewing. And thanks very much to all of the fabulous bloggers who have shared wonderful tutorials! You guys rock! 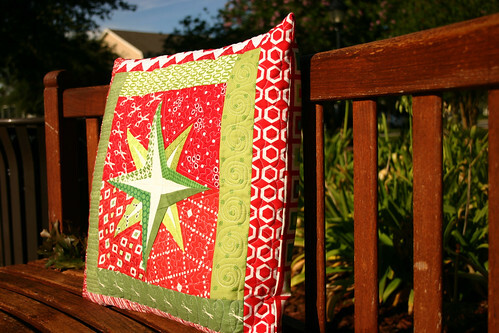 I'm so happy that Amy of Diary of a Quilter is joining the Christmas in July festivities today! I got the opportunity to meet Amy last year at Sewing Summit, and I have to say she is just as sweet in person as she seems on her blog. 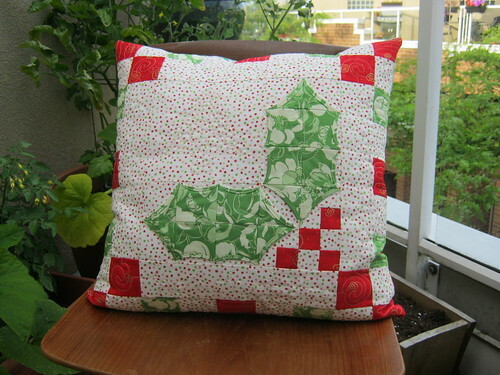 Amy's blog features loads of quilty tutorials as well as a pattern shop. I think that her Rainbow Connection quilt might just be my favorite...in part thanks to its nod to Kermit the Frog's famous "Rainbow Connection" song from one of my personal favorite movies, "The Muppet Movie." Today, Amy's sharing with us an easy fat quarter bag tutorial, perfect to gift to the women in your life! 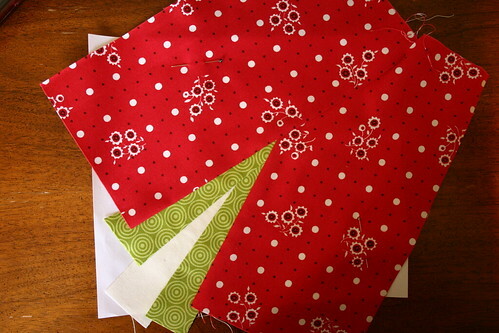 Everyone's got a few fat quarters lying about, why not use them to make a great bag to give as a gift for the holidays? Make sure to stop by to say hello to Amy today, check out her tutorial, and to enter to win a gift certificate to Pink Chalk Fabrics! I'm really excited to introduce you to today's blogger for the Christmas in July party: it's Aneela Hoey, the fabulous fabric designer for Moda Fabrics and blogger behind the Comfortstitching blog. Her fourth collection, Cherry Christmas, is hitting stores soon, so keep your eyes peeled for it! She's been working up a boatload of lovely holiday projects to celebrate the release of Cherry Christmas, so you'll certainly find plenty of holiday inspiration at her blog. Aneela also has a book of embroidery patterns coming out in the fall, called "Little Stitches", so she certainly has been busy! Today, Aneela's sharing with us a wonderful tutorial for patchwork holiday stockings. 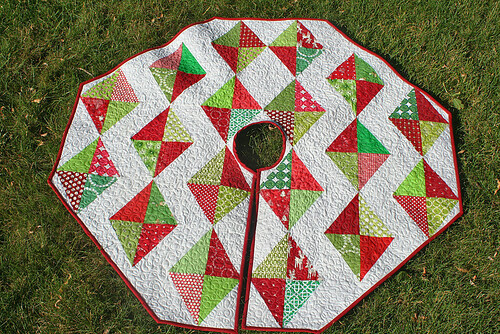 She's used her now-shipping and in-stock at Intrepid Thread Cherry Christmas collection, which I just love. Love, love, love the colors in the collection, and the prints are just darling in these stockings! Make sure to stop by to say hello to Aneela, and enter to win a fabulous bundle of holiday fabrics from The Intrepid Thread! The second week of Christmas in July festivities kick off today. Have you met Melissa? She's the blogger behind the aptly titled Happy Quilting blog and a momma to five kids, and somehow she still finds time to sew! Today, she's sharing a fabulous tutorial for holiday strip quilt called Ribbons with us, full of bright holiday colors, not to mention quick and easy to put together! Melissa's also hosting a super fun Tetris quilt-along right now that I'm having a hard time resisting at the moment. Such a fun idea! She also hosts a weekly link-up called T.N.T. Thursdays, encouraging all of us to Try New Things every week in our crafting. Today is my first Sew Day with my new local guild, the Tampa Modern Quilt Guild. It looks like we're going to have a pretty good turnout today, which is really exciting...and nerve-wracking! I'm packing up my machine, along with a zillion half-square triangles and coordinating squares for my Patchwork Wheel scrap quilt to work on today, and I'm really looking forward to spending the day sewing. It's been a great week, and there's still four more great handmade holiday tutorials coming your way next week from Melissa of Happy Quilting, Aneela of ComfortStitching, Amy of Diary of a Quilter, and Felicity of Felicity Quilts. Happy Friday! Are you ready for another dose of holiday cheer? Today's blogger is Sara, from Sew Sweetness. Sara is an extremely talented sewist - she's one of those triple threats who can quilt, sew amazing garments, and sew beautiful bags. Today, Sara is serving up a beautiful, detailed tutorial for making a gorgeous handmade bag called the Conversation Bag, which is a fabulous gift for any of the women in your life. Click on over to check out Sara's tutorial and to enter to win a gift certificate from Pink Chalk Fabrics. Have you seen Sara's latest quilt top finish? I absolutely love her take on Tula Pink's new Space Dust pattern, I just love all those solids!! #72, Bree of Distant Pickles! Congratulations, Bree! You should be receiving an email from me shortly! Stay tuned for the rest of the Christmas in July posts, running through next Thursday! Happy Friday to you all! Have a great weekend! Welcome to day four of the Christmas in July blog hop! 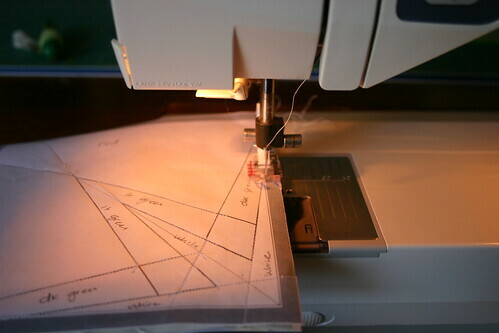 Today's blogger is the fabulous Lee from Freshly Pieced. Lee is an unbelievably talented quilter, who has an incredible knack for writing tutorials and giving traditional blocks a modern spin. She recently stitched up this gorgeous NY Beauty pillow for a swap. I just love the use of solids with varying values, it's so pretty! Today, Lee's sharing with us a gorgeous Christmas tree skirt tutorial, which I'm super excited about, because I sure could use a gorgeous tree skirt like this! Pop on over to say hello and see Lee's wonderful tutorial, and to enter to win a beautiful holiday bundle of fabrics from The Intrepid Thread! Oh my, I'm so excited to introduce today's blogger for the Christmas in July festivities! Ayumi, of Pink Penguin, is one of my favorite bloggers, I just love to see what she's up to! 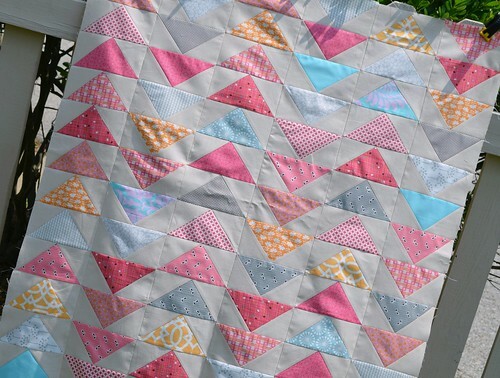 Have you seen her adorable popsicle paper piecing pattern, available now at Superbuzzy! Ayumi has partnered with Superbuzzy for a year-long paper-piecing-along, and the popsicle pattern is the first in the series. Today, Ayumi is sharing a wonderful fabric tape tutorial with us, perfect for dressing up your holiday packages and using up your scraps. Pop on over to say hello and check out Ayumi's wonderful tutorial, and for a chance to win a gift certificate to Pink Chalk Fabrics! I hope you're ready for some more holiday inspiration! 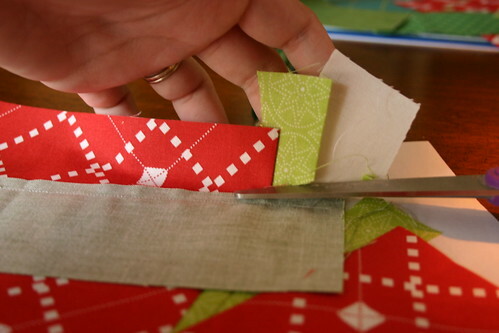 Today's Christmas in July tutorial comes from Jessica of Sew Crafty Jess. 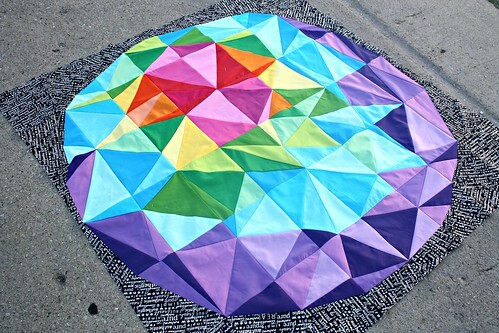 Jessica loves color, and uses it so confidently throughout her quilty projects. Have you seen her most recent quilt top? Love, love, love the soft, sherbert-y colors! Today, Jessica is sharing a tutorial for an E-Reader Sleeve with us. Stop by to check out her tutorial and to enter another awesome Christmas in July giveaway! Happy Tuesday, all! 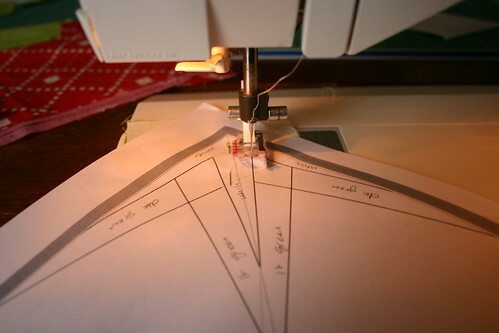 Ready to get a head start on your holiday sewing? I know I am! Last Christmas, I remember feeling so frustrated at how little I was able to sew for the holidays, given how hairy and crazy things were around the holidays. This year, I've gathered together some good friends to help us all kick-start our holiday sewing way early, with some fun tutorials for both decorating your home and for handmade holiday gifts. Welcome to Christmas in July!! Today, I'm sharing with you a fun holiday pillow that you can use to add that festive feeling to your living room or even to give as a gift over the holidays. This pillow uses four paper pieced units to create a center block as well as colorful strips around the center block, much like a traditional log cabin quilt block. I love making holiday pillows, they're a fun and quick way to decorate! Let's get started, shall we? note: center block is 12.5" unfinished, makes a great quilt block, too! 2 pillow back pieces, 14" x 21"
. Double-check to make sure that the 1" line on the template measures 1", and if it does not, make sure that your printer scaling options are set to "Print at actual size." Trim off some of the excess paper, but be sure to leave some white paper around the gray rim of the block template. 2. Start by placing your white center piece in the center of the back, unprinted side of your template paper, with the wrong side of the fabric touching the paper. Align your fabric in the center of the #1 area of the block, making sure your white fabric overlaps over the edges of area #1. Pin in place. 3. Next, line up your first light green piece, for area #2. 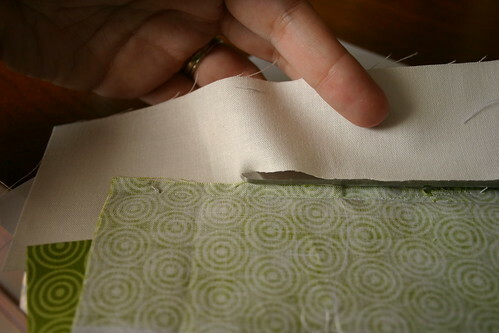 Align your light green fabric approximately 1/4" beyond the line between areas #1 and #2 on the template, right sides together with your pinned white fabric. 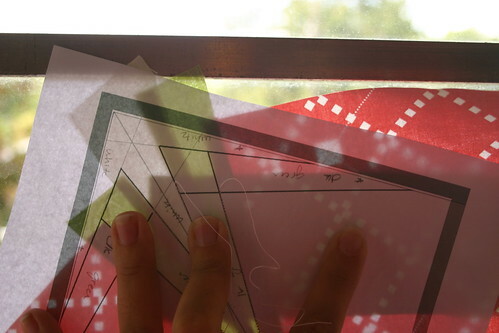 Stitch along the line, and be sure to shorten your machine's stitch length to approxiamtely 1.5 mm. This will perforate the paper, making it easier to remove when we're all done. 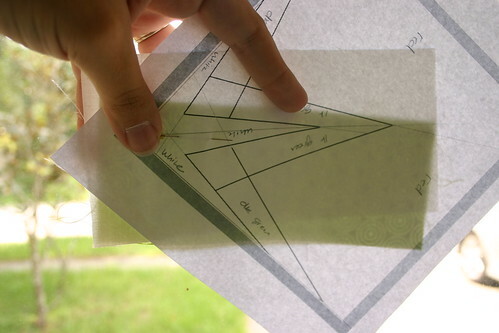 Flip your paper piece over, and make sure to open your light green strip to ensure it covers the entire #2 section. Then, you can trim the excess remaining white fabric, trimming down to a 1/4" seam allowance. Finger press the seam, then set the seam with a hot, dry iron. 4. Repeat Step 3 for the adding piece #3, an additional green piece that borders the opposite side of the white fabric you began with. 5. Next, let's add some holiday red. Align a 5" x 6" piece of red fabric along the line between area #3 and #4, right sides together. Pin in place, if needed. Stitch along the line between area #3 and #4, and trim excess seam allowance, as needed. Press seam to set your work. 6. Repeat for Step 6 to cover area #5 of your template, making sure to stitch into the gray seam allowance border. 7. To finish area 6 on the template, align a strip of dark green fabric with the fabrics you've sewn in place so far, rights sides together, with approximately a 1/4" overlapping the seam, as shown. Stitch along the seam line, making sure to stitch into the gray seam allowance that surrounds the template. Clip your threads and flip your template piece over. 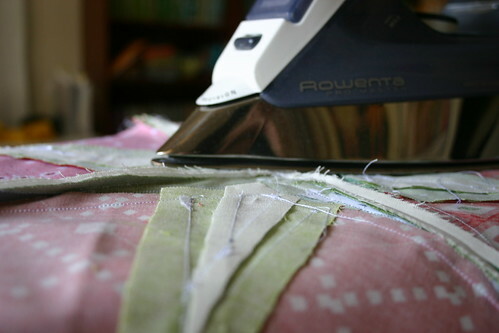 Trim your excess fabric to approximately a 1/4" seam allowance, and press to set your work. 8. 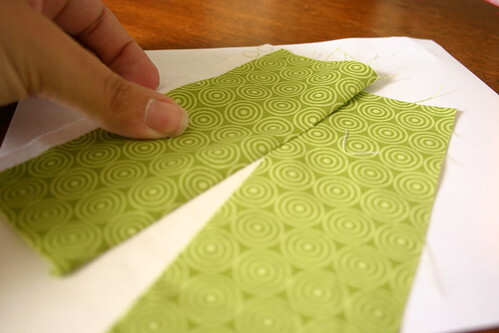 Repeat step 7 to cover area #8 on your template, using your other strip of dark green fabric. 9. 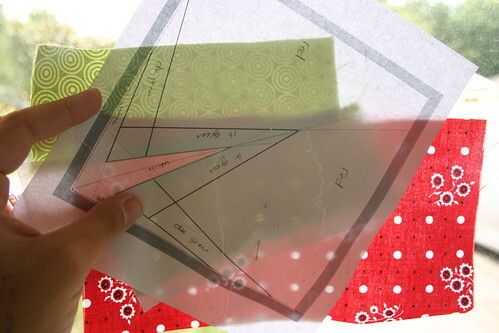 To finish piecing the template, we'll use two strips of white fabric. This will become the center of the mariner's star. 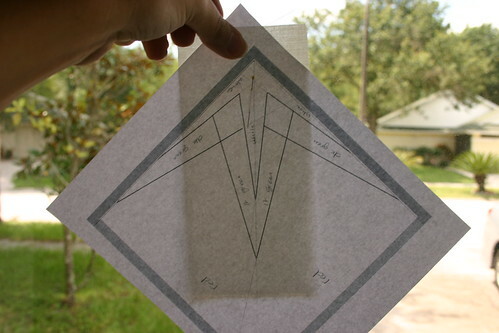 Align your white strip, right sides together the fabric side of your template, approximately a 1/4" beyond the seam line for area #8 on your template. Pin, as needed. Stitch along the seam line, making sure to stitch into the gray seam allowance border. 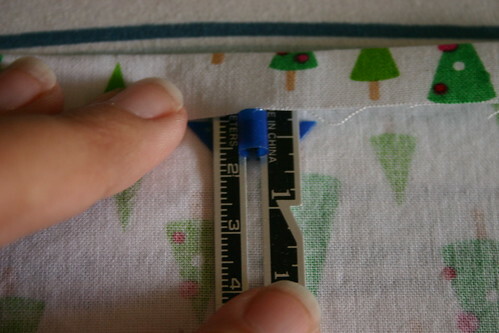 Trim excess fabric to create a 1/4" seam allowance and press to set your piecing. Repeat for area #9. 10. 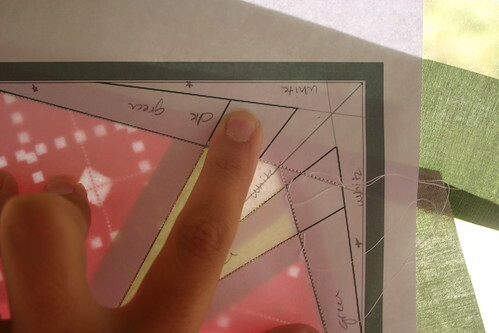 After you've finished piecing each template piece, trim it down, trimming along the gray edges of the template. Do not cut off the gray seam allowance border! 11. 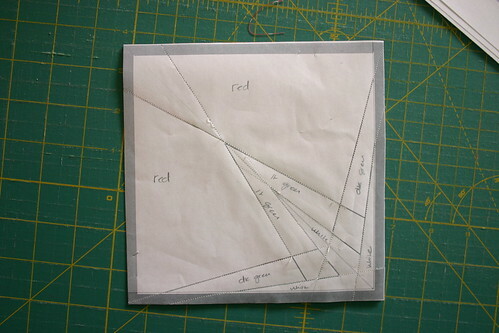 Repeat steps 2-10 to make a total of four paper pieced units. Lay out your four finished template pieces in an order that you like. Feel free to swap them around as needed until you're happy with your layout. 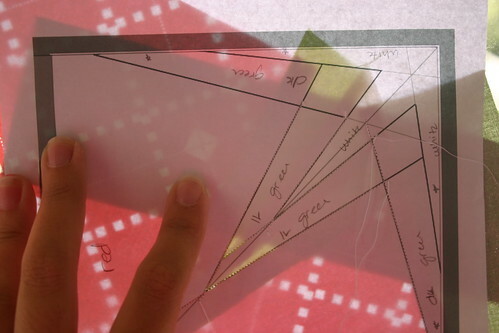 At this point, you can remove the paper from your templates; or you can choose to remove the paper after seaming your four template pieces together, it's just a matter of personal taste. 12. Sew all four finished template pieces together. Press seams open to reduce bulk. 13. Add the log pieces, in size order, around the edges of the center block, pressing seams open as you go to reduce bulk, starting with the four green logs, then the red logs. 14. The pillow top finishes at 21". If yours turns out larger, don't trim it down just yet. First, layer your finished pillow top on a piece of batting and baste as desired. Then, quilt your pillow top however you'd like. Once you've quilted the pillow top, trim down to 21" square, as needed. 15. To finish the pillow back, fold 1/4" down on the top long side of a back piece. I'm terrible at this, so I use a seam guide as shown above to make sure my fold is consistent across the length of my fabric. Use a hot, dry iron to press in place. Repeat, folding down a total of 1/2", and topstitch along the edge. Repeat for both back pieces. 16. Lay your finished pillow top face up on a flat surface. Align the raw edges of a back piece with the top of your pillow front, right sides together, with the seam you just finished in the center of the pillow top. Repeat with the other back piece, aligning with the opposite side of the pillow, so that finished seams overlap. Pin in place, all the way around the pillow. 17. Stitch 1/2" seam all the way around the pillow, backstitching to secure your threads. 18. Remove the pins and reach in through the envelope opening you've created to pull your pillow front through. Make sure to use a pencil eraser or other turning tool to push the corners out all the way. And voila, a lovely finished pillow! is sharing in the Christmas in July fun today, giving away a wonderful bundle from her shop, full of gorgeous reds and greens. I especially love how these fabrics aren't necessarily holiday fabrics, they don't use typical holiday graphics or designs, but the colors still evoke that holiday feeling. To enter in the giveaway, tell me about your favorite holiday decor item at your house. Is it a family heirloom, something you've made, a favorite item you've purchased? I'd love to hear about it! This giveaway will be open through the end of the day Thursday, and a winner will be announced on Friday. I am so excited to tell you about the new blog hop that I have put together coming this July. If you're anything like me, by the time the holidays roll around, you're too busy for holiday sewing, so we're going to give you a kick start to your holiday sewing for your home as well as for gift-giving by sharing 10 fresh tutorials from some of your favorite bloggers to inspire you to pull out those festive holiday colors and fabrics and get sewing. Make sure to visit each and every blogger not only for inspiration to get a head start on your holiday sewing, but also to help you acquire some new holiday fabrics, as we'll be giving away fabrics and gift certificates throughout the festivities. I hope you're as excited about this one as I am!